I get asked quite a bit if I’m vegan or vegetarian because many of the recipes I post are plant-based. To that I say, “Nay!” I do love meat dishes, but I also love veggie dishes AS MUCH. So, for my fellow meat-eaters out there, I present this MONSTER burger – The Monster Morel. I was at the Temecula Farmers Market last week, and then I saw them: Morel mushrooms. I had heard of them; I had seen them in pictures, but never in person. Never for sale! So, even at $15 for a small, 8 ounce bag, I did it. Expensive? Yes, most definitely. Would I do it again? Hell motherf#@&in YEAH! Don’t worry – if you can’t find morels, don’t fret. You can still conquer this monster with some regular baby bellas or crimini’s. Just slice them up, and prepare the same way as below minus the toothbrush scrubbing. After this Monster purchase, I was stressin’ on how to prepare them. How do I clean them? What should I make? They had to be a garnish, because there simply wasn’t enough of them. The answer was just to prepare them simply, and get them into something where they would shine. I thought mushroom topped burgers were the answer, and they turned out sinfully deeeelish! So tell me, what rare or specialty food item would you shell over the dough for? Inquiring minds want to know! Heat a skillet over medium heat, and add the olive oil and onions. Cook for about 20-30 minutes, stirring occasionally until the onions are soft and starting to turn a golden brown color (caramelized). Add the salt, pepper, and brown sugar, and stir until combined. De-glaze the pan with the stout, and cook until all of the beer is absorbed, about 4-5 minutes. Set aside. To clean the morels, start by cutting them in half. Quickly run under cool water, and use a soft-bristled toothbrush to clean their numerous little cavities and rid them of any grit. Dry gently with paper towels. Place the mushrooms in a small bowl, and sprinkle in the flour. Cover with plastic wrap,and shake gently to coat. Bring a skillet up to temperature on medium heat, then add the butter. Add the mushrooms, and cook, stirring gently for about 7 minutes. Season with salt and parsley, gently stir again, and place in a bowl for later use. Shape the ground beef into four equal patties (should be 6 ounces each), and indent the middle with your finger (prevents against burger bulge!). Return the mushroom pan to the stove and bring it up to it’s highest temperature. You should have enough residual butter. Turn on your broiler also. While the pan comes up to temperature, season the patties with salt and pepper. Sear the burgers for three minutes on each side for a medium burger, and place on a cookie sheet. Top the burgers with the sliced cheese, and place under the broiler until the cheese is just melted, about 1 – 2 minutes, depending on how melty you like your cheese. 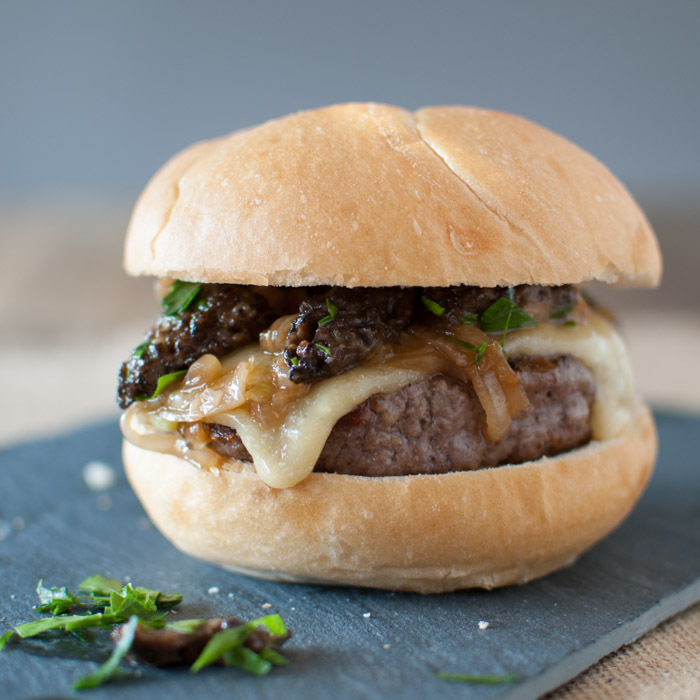 Split the burger buns, and build your burger with the patty first, then stout glazed onions, and finally the mushrooms. Top with the crown of the bun and devour the monster! Haha yeah, a couple Ironfire bombers will do ya fine, Gary! It’s a really nice coffee-forward stout. I love that brewery! hahaha! Burgers will be the end of me! Been spending to many sunday afternoons on Butcher & Son’s with my guy! You make me wanna take the task home, seriously! B O Y…. Burger of the year!!! Aww thanks so much Bill!!! What’s your favorite way to prepare morels? It’s always a pleasure to hear from someone with exieptrse. That is a seriously good deal for Morel Mushrooms. I may have to take a drive to Temecula – I can only find dried ones here in the desert. This burger looks awesome! Yeah, it seemed like a good deal based on what the mushroom guy told me. I’m kinda scared to go back to the Temecula farmer’s market, because if they have more, I don’t know if I’d be able to resist buying them! I love Morel Mushrooms! I love that you put them on a burger and paired them with Dubliner Cheese. I usually just sauté them with butter and garlic. And yes, Morels are worth their weight in gold.